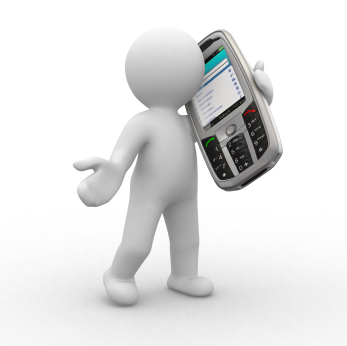 SMS, or text messages, are typically read within 3 minutes of receipt, vs. 48 hours for emails. 1. What do you want to accomplish? If you run a business, you probably want to drive sales (duh!). But consider that SMS is a much more personal medium than email or even social media to some extent. Think about how you can use the opportunity to grow long-term relationships, and harness the power of SMS beyond a one-off promotion or bulk alert. 2. Get a short code. A short code is a five or six digit number from which you can deliver messages, and consumers can message you back. There are two basic types: dedicated and shared. Dedicated codes are great for maintaining the most control over your brand messaging, but they are costly, so shared codes are often a good bet for small- to mid-sized businesses. 3. Build your opt-in list. SMS marketing is a fantastic tool for driving repeat business, so start by inviting your Facebook fans, Twitter followers, or in-store patrons to text a keyword to your short code to begin receiving offers and alerts. Get off on the right foot by offering an incentive to sign up. Remember, you can’t send anyone a text until they’ve opted in, and you must always give them an easy way to opt out. Check out the Mobile Marketing Association (MMA)’s best practices for more information. 4. Make it personal. These days, even friends have to be careful about mass texting for risk of appearing impersonal, and the same is true for marketers. While you still want to respect your audience’s anonymity, the content should be customized. For example, ask about a customer’s favorite dish or product in the sign-up form, then send a related offer. 5. Optimize. As with any marketing program, it’s important to test and compare. Are you sending most of your texts during the week? Try sending on the weekend and see how this affects response rates. Are some offers being redeemed more often than others? Move the underperformers out and test some new ones. Other industries using SMS services are Financial Services, Leisure, Estate Agencies, Beauty/Hair Salons, Education, Vehicle Dealerships, Dental/Optical, Fast Food, Councils, Legal, Restaurants and Travel Agents. A2P messaging occurs when a business contacts a customer. There are several industries that are already utilizing this type of SMS, and its future looks bright. Revenue from A2P Messaging will exceed $70 billion by 2016. By 2016, it is predicted that A2P messaging will surpass person-to-person messaging. Connecting the Dots: Why Is SMS Important for Businesses? 87% of the world’s population has a mobile phone. 45% of customers notice mobile advertising. 29% of people respond to mobile advertising. 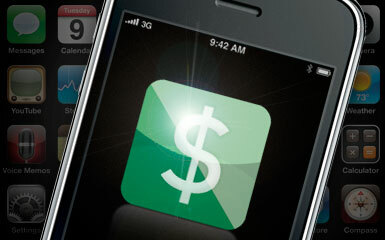 Mobile marketing budgets are growing at a rate of 26% every year. Brand spending on mobile advertising will grow from 0.5% of the total advertising budget in 2010 to over 4% in 2015. Businesses are starting to understand the value of SMS for their business, and many industries are on board. The reach of mobile is unprecedented, mobile marketing budgets are rising, and businesses are seeing great results from leveraging the power of SMS. Don’t let your business get left behind! 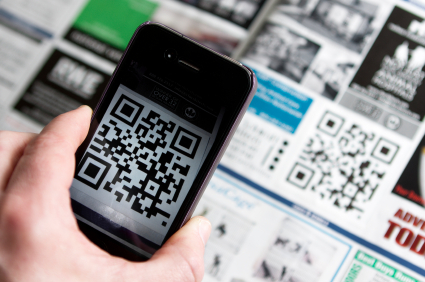 Nowadays consumers cannot go a day without seeing a QR code – whether it is on a magazine page, billboard or bus shelter. In past years, SMS calls to actions were seen just about anywhere. However, many current marketing efforts are not incorporating SMS, but rather placing a QR code on products to drive user engagement. “SMS gives brands an easy, broad reaching and low cost means of consumer communication via the mobile channel – and as you know, is ubiquitous, but it lacks the rich media experience that QR codes can deliver,” said Laura Marriott, CEO of NeoMedia Technologies, Boulder, CO.
“From some of the campaigns that we have run alongside SMS call to actions, the QR codes are outperforming the response from SMS significantly,” she said. “In many times a factor of 10 or more times more successful. Conde Nast’s Allure magazine has implemented Microsoft Tags in its August giveaway issue. The publication saw success the first time it ran mobile bar codes on its magazine pages and found that its annual “Free Stuff” giveaways resulted in 444,572 scans. Allure is not the only publication incorporating QR codes into its static pages. Magazines such as People, Cosmopolitan, Lucky, GQ and Women’s Health are using mobile bar codes to drive readership engagement. Additionally, companies such as Starbucks, Bath & Body Works, Chili’s, Taco Bell and Red Bull are among the many that have incorporated QR codes into their marketing efforts over the past year. “I believe QR codes still have that newness factor associated with them,” Ms. Marriott said. “It’s about that sheer convenience and adoption opportunities that QR codes offer to brands, enterprises and consumers alike – answering the need for information on the go, interactivity, measurability and traceability – that will ensure that the market for mobile bar codes will continue to grow this year. “Already we’re seeing impressive adoption by brands, handset manufacturers and operators for use in mobile marketing and advertising campaigns, and this will continue as barriers to adoption such as consumer education, handset integration and consumer awareness are overcome,” she said. “Many 2D mobile bar codes provide a wide range of benefits above and beyond what a SMS campaign can offer,” Ms. Skogg said. “This combined with the increasing consumer awareness of what 2D mobile bar codes are and the ways they can access them increases the likelihood of consumer engagement,” Ms. Skogg said. “Given that mobile bar codes have the opportunity to be so much more than a link to a mobile Web site, 2012 will be the year that marketers will explore the opportunities that exist beyond the mobile site, realizing they have the ability to impact consumers at all stages of the consumer decision journey,” Ms. Skogg said. “Mobile initiatives will be designed to engage consumers, drive purchase consideration, activate a sale or build a sustainable mobile connection,” she said. “With all of the robust mobile bar code activity in 2011, we believe the stage has been set for brands to develop and refine comprehensive, strategic approaches to activating mobile bar codes in 2012. “SMS marketing is as strong as ever,” said Doug Stovall, senior vice president of sales at Hipcricket, Kirkland, WA. “Not everyone has a QR scanner or even a smartphone, but most everyone has a cell phone with the ability to send and receive SMS messages. “Not according to comScore whose last report said that less than 10 percent of Americans have downloaded a reader and scanned a QR code,” Mr. Miller said. “That’s a really low level of engagement compared with the ubiquitous penetration of SMS. 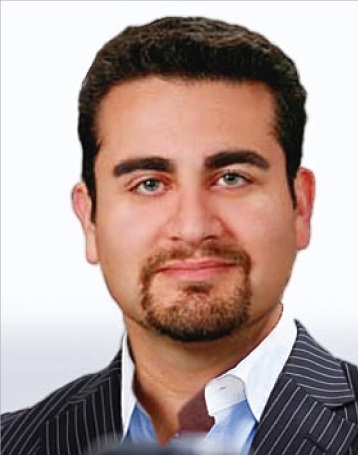 “Unless you’re going to provide an alternative call to action, those ads might as well be in Spanish,” he said. “So, though we love seeing any actionable elements in any ad, SMS is the only engagement tactic that marketers can rely on for maximum reach. “Prices are finally right and we now have great tools to design and transcode the content for maximum deliverability,” said Randy Atkisson, executive vice president of sales and business development at Sumotext, Little Rock, AR. “Impulse decision” usually has a negative connotation — except when it comes to making charitable donations via text message. A recent study shows that almost one in 10 Americans has donated via text— and that it was an impulse donation. The Pew Research Center surveyed the response time for donations that came in via text message in the aftermath of the 2010 earthquake in Haiti. Three quarters (73%) of people surveyed who donated made their contribution the same day they heard about the campaign. And 76% said they do little research before making the donation. There are some major pluses to donating via text. No snail mailing checks or waiting on hold while you call-in to make a contribution. The speed at which money can come pouring into relief efforts with text donations could have a major impact on the recovery efforts, possibly helping solutions be implemented quicker. Those who were surveyed for this study gave to the “Text for Haiti” campaign, which was promoted by Michelle Obama in a public service announcement shortly after the quake. The campaign asked people to donate by texting “HAITI” to 9-0-9-9-9 to make a $10 donation to the American Red Cross’ relief effort in Haiti. The American Red Cross had a similar program after the devastating earthquake and tsunami in Japan. Currently, the Red Cross has an ongoing text donation program. 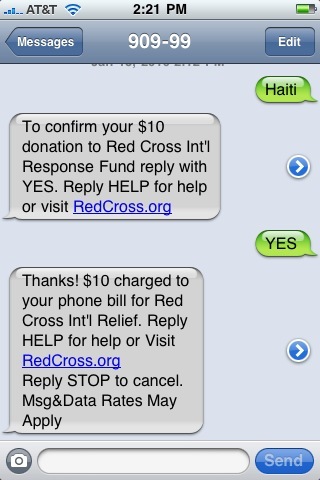 Just text “REDCROSS” to the same number above (9-0-9-9-9) to make a $10 donation to the organization. Nonprofits are utilizing social media and real-time tools to make giving easier and faster. The World Food Programme released a food calculator app that lets users type in their favorite food, serving size and estimated cost and the app shows you how many children that could feed, and then make a donation. Last year, an iOS app called iSnooze was released that donates your money every time you hit the snooze button.